Want a practical place to store your CDs, DVDs, games, gadgets, computer hardware and other equipment? With our adjustable shelving units you can maximise your space and ensure your home is clutter free. Made from high quality pine, our modular shelving units are perfect for all homes and offices. Whether you have a cosy apartment and require a compact system which doesn’t take up all the floor space or just need a practical bookshelf to proudly display your collection, with a Shelfstore system, you’re sure to find the ideal solution. 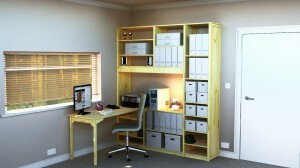 Modular shelves offer flexibility, helping you create the ideal space and access items with ease. Each shelf can be installed in just 10 minutes and can withstand heavy loads, so you can display that beloved ficus plant, plus all your encyclopedias and family photo albums. If you decide to add more books to your collection or accumulate more goods over the years, our shelving units can be adjusted to create a completely different system. Expand your unit and add a set of drawers to store wrapping paper, ribbons and sticky tape, or a handy filing cabinet to keep paperwork organised. A folding table will allow you to complete artwork and puzzles without taking up all the room in your office or lounge. Here at Shelfstore we offer a single product with dozens of interlinking components, so you can create your very own storage solution. Versatile and strong, our units are perfect for your home or workplace. As experts in our industry, we have supplied library and storage shelving to many schools and universities across the country. Each system can be easily taken apart and rearranged in minutes – ideal for those who often move home or like to alter their furniture set up. For more information on our adjustable, modular shelving units, contact our friendly team today.